The characters are introduced and recount some of their experiences with Jesus the Nazarene. Jesus and the disciples enter the city to a tumultuous welcome from the common people. The religious leaders have other feelings about Jesus - they don't want a disturbance of any kind that might give the Romans any reason for a crack-down. Like none before him, Jesus captures the imagination of the people with his insightful teaching. Out in the market place, by the river and in the Temple Courts, crowds gather to hear him speak. The plot by the religious leaders to silence Jesus is gaining momentum, and has reached into his inner circle. Meanwhile, Jesus shares an incredibly intimate meal with his disciples. 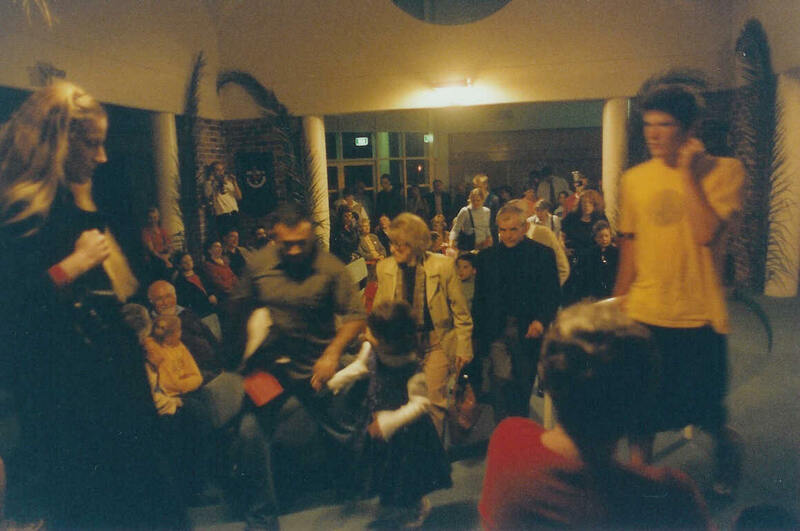 They move with the audience to a quiet room away from the crowds and the noise of the city at Passover time. Only Jesus knows what is to come. The disciples follow Jesus to their favourite place, a garden on the Mount of Olives. As the smoke from the fire rises into the night, the weight of the world is on Jesus' shoulders, and the disciples are tired. Judas has done a deal with the Chief Priest, and Jesus is arrested. Jesus is tried in a religious court, with an angry crowd shouting for his execution. The Jews do not have the power to put Jesus to death, under the terms of the Roman occupation. After finding him guilty, they send him to Pilate, the Roman governor, to use his power to achieve their aims. Pilate is cornered by politics, religion and his own ego. Unable to find any reason to have Jesus put to death, he eventually relents to the requests of the Jews out of strong sense of self-preservation. Jesus is carried away . . .
Jesus has been put to death. In the aftermath, the depression and hopelessness of the disciples turns to amazement. As Judas is left in the wake of his own choices, the disciples encounter Jesus again. He leaves them with a world wide challenge, and we hear the stories of the lives (and deaths) of the disciples as a testimony to the power of Jesus' life and teaching.